Daniel Libeskind's Jewish Museum in Berlin, which formally opened in early September, three years after its completion, is the most talked-about work of architecture since Frank Gehry's Guggenheim Museum in Bilbao. Libeskind's building attracted some 350,000 visitors even before its exhibits were finally installed this season, making it an architectural destination of the first order, though many who came to see it were impelled by religious and communal reasons rather than by aesthetic ones. The enthusiastic reception for Libeskind's building is altogether appropriate, for it is in many respects a profound and powerful work of art. And yet it is not exactly a success: there remains the question of how well this extraordinary architecture serves the complex purposes of this institution. Apart from Gehry himself, who has improbably popularized this kind of demanding and idiosyncratic expressionism, Libeskind is the most conspicuous beneficiary of the so-called Bilbao Effect. Gehry's masterpiece has prompted cultural institutions around the world to clamor for similarly adventurous buildings that will generate as much publicity as the Basque branch of the New York-based multinational museum chain (though the realization that such a coup may be a once-in-a-lifetime phenomenon has eluded many patrons). The glittering precedent of Bilbao was certainly a major factor in Libeskind's being chosen to design additions to the Victoria & Albert Museum in London and the Denver Art Museum, both of which hope to raise their international profiles with his exceptionally assertive designs. Although this development in some ways is good for architecture--intensified competition is always good, and as a result architecture is now the focus of more public attention than it has enjoyed for decades--it can be less than beneficial for the sponsoring parties. Tempted to favor spectacular schemes at the expense of functional logic, museums everywhere are falling prey to the notion that dramatic physical form is the most important aspect of a building. It is certainly necessary to find a way to draw in an audience distracted by more media stimulation than ever before; but what this audience will actually encounter once it gets inside seems to be given much less thought. This disjunction between external style and internal substance appears to occur in inverse proportion to the quality of the works that a museum possesses. Yoshio Taniguchi's quietly minimalist infill scheme for New York's Museum of Modern Art, now under construction, signifies that the world's most distinguished collection of twentieth-century art, not the architect, is the star. Conversely, the dazzling theatrics of Gehry's building at Bilbao stupendously mask the artistic emptiness of the museum itself, the Guggenheim's deep deficiencies in acquisitions and programming. 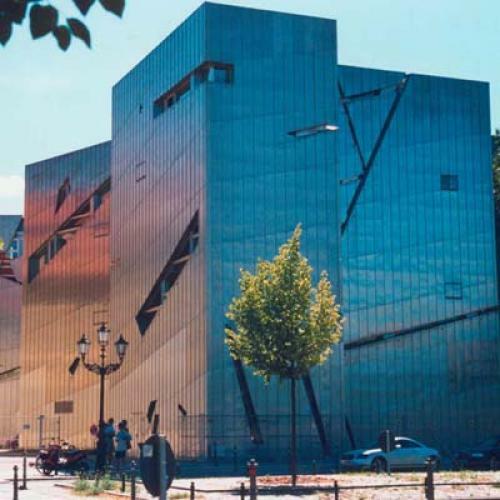 When, in 1989, the Polish-born, Israeli-raised, American-educated Libeskind was chosen from among one hundred sixty-five architects to design a new Jewish Museum for the once and future German capital, he was at a considerable disadvantage. Winning an architectural competition in Europe is far from the promise of getting to build that is implied by such contests in the United States: in Europe a first prize is often seen as the opening of a dialogue rather than as a firm commission. Moreover, Libeskind was being asked to provide the spiritual identity for an enterprise with limited holdings and an amorphous sense of purpose, which was confirmed by the fact that the museum had gone through five changes of name and as many directors in the decade before the building was initially completed. The original Jewish Museum, a miscellany of religious artifacts and works of art housed in part of the sprawling Oranienburg synagogue complex, was dedicated a week before Hitler took power in 1933. Five years later it was burned by the Nazis on Kristallnacht, its contents destroyed or scattered. Beginning in the 1960s, when the remnants of the city's Jewish community called for a new museum to replace the old one, the Berlin Municipal Museum began to collect objects relating to the community's history and established a special department within the museum for them. In due course, this departmentalization came to be seen as a kind of ghettoization, and pressure mounted for a separate institution devoted wholly to the subject of Germany's Jews. By filling in the lacunae of the Jewish Museum's losses, Libeskind might be said to have succeeded too well. For while there can be no denying that he has created an architectural setting of immense psychological and emotional impact, his building to a great degree places the Holocaust in the very forefront of Jewish history, making it the defining standpoint for the consideration of the entire Jewish tradition. Now that the long-awaited displays have been installed and the enterprise at last can be viewed in its totality, this lachrymose emphasis seems clearer than ever. There is such a thing as architecture being too artful for its avowed function, and the Jewish Museum in Berlin is a fine illustration of that conundrum. The museum's current director, former U.S. Secretary of the Treasury Michael Blumenthal, engaged the New Zealand exhibition designer Ken Gorbey to devise a narrative presentation emphasizing the achievements of the Jews and downplaying the building's predominant architectural identity as a Holocaust memorial. Gorbey came up with a series of thirteen "topical islands," only one of which deals with the Nazi genocide. The dozen others deal with subjects ranging from the eighteenth-century "court Jew" Oppenheim to the rebirth of the Jewish community in Germany after World War II. The objects on display include a medieval copy of a fourth-century Roman decree mentioning the presence of Jews in Germany for the first time, a set of circumcision instruments, a pair of blue jeans tailored by the German Jewish '49er Levi Strauss, and the protective glasses worn by Moses Mendelssohn while he earned his keep in a silk mill. Computers are integrated throughout the installation, dispensing information on Jewish customs and rituals: the typical mishmash of contemporary pop museology. Yet with one glaring exception--a tasteless floor installation composed of scores of metal discs, each sculpted with a screaming face--these galleries stop far short of the attempted synesthesia of the heart-rending display designed by Ralph Applebaum Associates in James Ingo Freed's United States Holocaust Memorial Museum in Washington, D. C. There visitors are issued a passport with the vital statistics of an actual victim of the Final Solution--a justifiable if misguided attempt to personalize one's apprehension of the catastrophe, the overwhelming magnitude of which puts it beyond imagination for most people. The realization that such sympathy-inducing gimmicks are pathetically unequal to the gravity of the crime caused the Berlin museum's display designer great concern that his efforts not be interpreted as a theme park. "We are not going to be a Disneyland," vowed Gorbey, "but we are going to use up-to-date techniques." And so acute was the fear of museum officials that the new presentation would be seen as a vulgarization of an already beloved shrine that the press was banned from previewing the new displays. Interestingly, the person who seemed least fazed by the new museological interventions was the architect himself, a man of optimism and imperturbability. Recently Libeskind told Die Zeit that "up until now, the emptiness dominated, and in that way the effect of the building was to concentrate too much on the extinguishing of Jewish culture"--and he added, with a certain disingenuousness, that "it is not a Holocaust museum, after all." To which I would add, with apologies to Dorothy Parker, "And I'm the Lubavitcher rebbe." One aspect of Libeskind's design that particularly appealed to the competition jurors was that his was the only one of the proposals in which the old Berlin Municipal Museum building--a renovated eighteenth-century courthouse in the Kreuzberg section of the city, just south of the newly redeveloped Potsdamer Platz--was not linked to the new structure by a bridge. Instead Libeskind joined the two structures with an underground passageway that alludes to the descent into barbarism that the Holocaust represented, and serves to disorient the visitor by removing any sense of easy transition from the charming old building to the frightening new one. Viewed from the busy street that fronts it, Libeskind's deconstructivist building, with its vertically zinc-paneled walls slashed with angry diagonals on every elevation of the sharply angular exterior, stands in brutal contrast to the graceful, ochre-stuccoed Baroque entry building. As is generally the case in Libeskind's work, the patterns of those incised lines are neither random nor the product of purely aesthetic considerations. He gauged those overlapping patterns by working from a map of Berlin on which he plotted the former addresses of cultural figures, Jews and non-Jews, who shared certain affinities of style or temperament--for example, pairing the assimilationist Jewish saloniste Rachel Varnhagen and the Protestant philosopher Friedrich Schleiermacher. The architect then drew lines connecting those coordinates and superimposed them on the fragmented faades. They in turn take their form from a similarly allusive ground plan, suggested by the angles of a shattered and scattered Star of David. More clearly distinguishable are a dozen smallish crosses cut into the zinc paneling. According to the museum's explanatory pamphlet, they make you "feel compelled to think about the links between the cross and destruction. You wonder about the connections between the church and the Holocaust." None of Libeskind's allegorical references is readily apparent to the average viewer without prior knowledge of the architect's intentions, and they are intelligible only when one looks at the ground plan (or, in the case of the Berlin building, if one views it from the air). This is proved by the fact that Libeskind's lightning-bolt-like Berlin layout was shamelessly copied, down to each precise angle, by the firm of Ashton Raggatt McDougall for the new National Museum of Australia, which opened in Canberra earlier this year. It reads no more as a deconstructed religious symbol Down Under than it does in the German capital. The author of the original plan has screamed bloody murder over this bald plagiarism. Libeskind has done the same in the past, accusing Peter Eisenman of ripping off his Jewish Museum garden for the 1999 design for the Memorial for the Murdered Jews of Europe, to be erected over the ruins of Hitler's Reich Chancellery next to the Brandenburg Gate. Even paranoids have enemies. Yet Libeskind's antipodean copyists were only following an age-old architectural tradition in which imitation was the sincerest form of larceny, though an interim of centuries, not just a few years, used to be considered a respectable interval. Libeskind's putatively innovative approach toward generating architectural form from representational objects harks back to an old-fashioned, literal- minded architecture parlante--buildings whose forms "speak" of their function. The Big Duck farm stand of 1931 on Long Island (immortalized by Denise Scott Brown and Robert Venturi), which sold the eponymous poultry, or Eero Saarinen's TWA Terminal of 1956-1962 at John F. Kennedy Airport, which resembles a bird in flight, are two well-known modern examples. Since Libeskind's analogies are best understood from above, a closer parallel might be Claude-Nicolas Ledoux's late-eighteenth-century proposals for a House of Pleasure and a Temple of Love: those state-run French brothels would have been laid out with floor plans in the shape of a giant phallus, flanked with pairs of testicular salons. Once inside the Jewish Museum, however, the hyper-cleverness of Libeskind's strenuously extraneous references--the mangled Magen David, the dot-to-dot address book of Berlin intelligentsia, the Pius XII perforations--are quickly obliterated by his profoundly disturbing manipulations of space. Emerging upward from the tunnel connecting the old building with the new, you enter a criss-crossed nexus of corridors with slightly sloping floors that wholly subvert the stability and the regularity that we customarily associate with architecture. The three-degree pitch of the walkways is not pronounced enough to feel like a ramp, and yet it is clearly not a normal surface either. You literally begin to lose your footing, and the physical and psychic displacements of the Holocaust become palpable. The feeling of unease is further accentuated by the harsh overhead fluorescent lighting in that Caligari-like concrete labyrinth. Relentlessly cold and industrial, this infernal maze speaks chillingly of the Nazis' mechanization of death. Yet it does so without resorting to the literalism of Freed's Holocaust Museum, with its oven doors, prison catwalks, and so on. Here Libeskind summons up a far more desperate sense of helpless entrapment, all the more oppressive for its nightmarish abstraction. It is as scary as one of those horror movies in which you never see the monster, a prospect always more terrifying in the mind's eye than when the dreaded thing is actually depicted. Interrupting the collision of corridors are seven "voids"--inaccessible walled-off spaces that refer to the removal of the Jews from the continuum of German culture. (Libeskind, who descends from a famous Hasidic dynasty on his mother's side, subscribes to an almost kabbalistic belief in numerology, and his design choices are often informed by such symbolism.) As with the diagonal patterning of the exterior walls and the building's referential ground plan, the average visitor will not understand precisely what is going on. You simply find your way around one of these obstacles without giving it much thought. And yet the sense that something is not right, that everything is really wrong, remains unavoidable. In his characteristically impenetrable texts Libeskind is apparently more concerned with stroking the intellectual vanity of architectural cognoscenti than in conversing with the informed public, but there is nothing esoteric about the effect of his building: it connects with the force of a blow to the solar plexus. That is also the case with the building's monumental Stair of Continuity, which leads from the intersecting passageways up to the temporary exhibition galleries on the second floor and to the permanent collection on the third and fourth levels, reached through doorways on landings. Dramatically angled concrete beams support the stairwell, which narrows as it rises upward toward the light--and a dead end. Slot-like windows cut into the exterior wall offer tantalizing but distancing snippets of the outside world, which continues in its quotidian indifference to what is being experienced inside this infernal construct--a perfect metaphor for the Holocaust if there ever was one. But none of these spaces prepares the visitor for the wholly devastating Holocaust Void, which is nothing less than the most affecting memorial chamber of modern times. Positioned at one end of the ground-floor corridor maze, this bleak concrete tower rises to the full ninety-foot height of the museum. It is entered through a massive door that obligingly swings shut behind you with a dull, menacing thud. It takes a few moments for your eyes to adjust to the dimly lit space within, an irregularly shaped, acutely angled trapezoid that is indirectly lit only by a narrow slit near the top. An industrial metal ladder leading up to the roof is set into one of the walls, but it begins so high above the floor that you would need another ladder to reach it. There is no escape and no refuge; there is not a comforting word nor an uplifting image--no inscription, no natural form, no eternal flame. Unseen perforations in one wall deliberately allow the sounds of the street to filter in, heightening one's feeling of abject apartness. Soaring but claustrophobic, seemingly controlled but wildly irrational, this mute chamber of horror is at once a cenotaph for the victims of a vast and unspeakable crime as well as an indictment of those who committed it. The only recent commemorative work that comes close to it in its monolithic simplicity and desperate depth of feeling is Maya Lin's Vietnam Veterans Memorial of 1981- 1982 in Washington, D.C. Here, of course, there was no possibility of inscribing all, or even most, of the names of the dead. And at the same time the Holocaust Void feels absolutely personal, like all the greatest art. You want to flee this unbearable confine, which will not be heated in winter nor cooled in summer, but since you are convinced that this is a sacred place you depart slowly. Berlin is a city loaded with memorials of all sorts to its slaughtered Jews, but with all due respect to the countless other artists who have struggled with the same challenge that Libeskind has here confronted, this building is certainly the definitive statement on the Holocaust in architectural form. If there are too many Holocaust memorials in too many places where their presence seems forced, then thank God this is the one in Berlin. After leaving the Holocaust Void, one is eager to exit a nearby door and take refuge in the E.T.A. Hoffmann Garden, which the architect named after the writer who once had an office in the vicinity. Although it is a relief to leave the terrible tower behind, this is no rose garden. Centering the courtyard is a tight sculptural grouping of seven rows of seven squared-off concrete columns. Each one is planted with a willow oak, the small grayish leaves of which remind Libeskind of the olive trees of Jerusalem. These trees have a horizontal growth habit that will cause them to spread like a continuous canopy over the whole installation. Slightly but again disorientingly skewed a few degrees off plumb, the tall, hollow forms are spaced widely enough apart for visitors to walk among them, but just barely. They crowd in on you, brush your clothing, and have much the same menacing effect as the tilting steel sculptures of Richard Serra (who initially collaborated with Peter Eisenman on the Memorial to the Murdered Jews of Europe and then broke with the architect, who is now executing the project by himself). Aside from what Libeskind insists is Eisenman's appropriation of his original idea, the garden composition recalls a number of other things as well. It evokes the serial minimalism of Sol LeWitt and Donald Judd of the 1970s, and the funerary architecture of Aldo Rossi, and even the stripped classicism of the Third Reich. What it most recalls, however, is the Old Jewish Cemetery in Prague, with its tilting tombstones crowded in dense ranks. Yet despite the poignant evocation of a graveyard, the trees and the sky overhead offer the indescribably welcome relief of nature so conspicuously absent from the harrowing man-made interior of the building. ; Libeskind's circuitous career. So quickly did the Jewish Museum find a responsive audience after it began receiving visitors in 1999 that many people called for the building to remain devoid of the planned historical exhibits. Libeskind has to a great extent usurped the original purpose of the building, producing a memorial scheme that overwhelms all other references and purposes, and I am inclined to agree with those who would have preferred the structure to stand as a pure monument. There are any number of other places in Berlin where the story of the Jewish people can be told with less competition from the architectural setting, but none that captures the spirit of a colossal human tragedy as effectively as this one. But the young man grew bored with what he saw as the narrow confines of musical technique, and after his parents came to the United States he decided to study architecture, which he saw as a broader stage for his creative aspirations. At Cooper Union, as a student of the late John Hejduk, Libeskind became particularly interested in the poetics of architecture, and from Robert Slutsky he learned much about collaging architectural form. He also became interested in architectural theory, which he later taught at various schools, producing hypothetical designs in the emergent deconstructivist manner, in which buildings appeared to be taken apart--a trope suggested by the literary device of critical deconstruction. Libeskind first came to wide public attention in 1988 as one of seven architects (including Gehry, Eisenman, and Rem Koolhaas) featured in the Museum of Modern Art show "Deconstructivist Architecture," curated by Philip Johnson and Mark Wigley. This was Johnson's self-conscious attempt to recapture the influential impact of his and Henry-Russell Hitchcock's epochal "Modern Architecture: International Exhibition," held at that same museum in 1932, which codified the International Style. "Deconstructivist Architecture" was intended to sound the death knell for postmodernism (which Johnson embraced in his own work of the 1980s) and to supersede it with a new look. Johnson insisted that deconstructivism was not yet another style but, as he wrote in the exhibition catalog, "a concatenation of similar strains from various parts of the world." Libeskind's featured project in the show, called City Edge, was proposed for Berlin's Tiergarten section, a verdant no-man's-land near the Wall. The scheme centered around a huge horizontal office and residential development that evoked the visionary megastructures imagined by the revolutionary architects of the late 1960s. But Libeskind also alluded to the Communist-built barrier adjacent to the site by elevating the colossal, extruded rectangular mass ten stories above street level on irregularly placed, tilted, and crossed stilts. "It subverts the logic of the wall," Libeskind wrote of his super-building, "by lifting itself up and creating a new public street below: it becomes a device for breaking down divisions rather than establishing them.... This becomes a new reading of the disorder within the city itself, a reading disclosed when the authority of the walls that define its structure are undermined." Whether or not this user-unfriendly scheme would have functioned as its designer intended, it marked an audacious departure from what had passed for avant-garde architectural practice in Berlin. That seemingly advanced but in fact nostalgic approach was typified by the postmodern housing built there during the 1980s under the auspices of the IBA (International Building Exhibition), the same group that gave Libeskind his prize. That award, and the later validation accorded the project by its display at MoMA, marked the turning point in his career, not least of all in Berlin itself. In his unwillingness to revert to prewar models for that post-apocalyptic city, Libeskind offered a provocative alternative to the notion that a conventional restoration of Berlin's shredded urban fabric was desirable, or even possible. Moreover, the degree to which commercial real-estate interests have ridden roughshod over the development of public space in Berlin since reunification lends added poignancy to Libeskind's unsentimental and yet idealistic stance. All of the aforementioned attitudes made Libeskind the ideal candidate for the design of what was initially called, with alarming circumlocution, the "Extension of the Berlin Museum with the Jewish Museum Department." In 1988, an open competition was announced for all architects in the Federal Republic of Germany to submit designs for the commission, and a dozen foreign practitioners, including Libeskind, were asked for proposals as well. At the age of forty-three, Libeskind won the Jewish Museum competition. At first it seemed that the timing of that prize could not have been worse, coming as it did in the year of the collapse of communism. Helmut Kohl's swift decision to reunify Germany and to reinstate Berlin as its capital caused a host of pending construction projects to be put on hold. But the sensitive nature of the Jewish Museum saved it from the scandal of being postponed indefinitely, and it was eventually given the go-ahead while many other government-sponsored schemes languished. Libeskind moved to Berlin to oversee the project, realizing that if he were not constantly present (a rare thing in today's globalized architectural practice), he risked losing the momentum. Thus he devoted an extraordinary amount of effort to this single work, which he invested with an obsessive attentiveness. Like most architects' first buildings, this one is crammed with ideas, and spurred by a desire to quickly demonstrate how much one knows, as if another commission might never come along. Unfortunately, Libeskind's proclivity to do too much in a single design has only grown since then. One wishes that he would simplify, simplify, rather than complicate, complicate. By far the most controversial of Libeskind's current projects is his planned addition to the Victoria & Albert Museum in London. Called The Spiral, this startlingly angular structure, intended to serve as an orientation center as well as an emblem of progressive attitudes toward design, would be inserted into a now-open quadrangle along Exhibition Road in South Kensington. Surrounded on three sides by the museum's Victorian buildings, and located directly across the street from Alfred Waterhouse's majestic and under- appreciated Natural History Museum, the site is an exceptionally sensitive one; but Libeskind has responded with his customary context-be-damned bravado. This is not a spiral in the manner of Frank Lloyd Wright's Guggenheim Museum. It resembles instead a fragmented, up-ended, monochromatic Rubik's Cube, its fractal-patterned tile skin quivering with the nervous tension that in some quarters is equated with architectural profundity. In recent years, the V&A has been plagued by a dispiriting series of administrative disasters, financial cutbacks, and plummeting attendance figures, all reflecting the larger malaise of an institution that has lost track of its identity and its mission. It is doubtful that this quixotic scheme would have proceeded this far were it not for its patrons' eagerness to create a stir at any cost. Such appetite for sensation has apparently blinded their eyes to the fact that this is not a very good design, its appropriateness to its setting aside. Quite correctly, Libeskind's costly and abrasive proposal (originally estimated at $120 million, some twenty percent more than Gehry's vastly larger Bilbao, but now subject to considerable cost-cutting) is causing many people to question whether this essentially symbolic gesture is the most pressing of the V&A's priorities. Britain's culture secretary has put the scheme on hold while the V&A's new director, Mark Jones, prepares a report on the institution's most pressing priorities; and it is hard to imagine that this extravagant public relations gesture will be seen as high among them. With some $75 million still to be raised for construction and the institution faced with a daunting array of problems, the future of The Spiral now seems very much in doubt. But this will not deter Libeskind, who is certain to receive more Holocaust- related commissions in the years ahead, as the generation that directly experienced World War II makes one last bid for remembrance before passing from the scene. He ought to take a leaf from Maya Lin's book in limiting the number of commemorative jobs he accepts. So overwhelming was the success of Lin's first work, the initially maligned Vietnam Memorial, that she came to dread the news of some fresh disaster, knowing that she would have to decline the request for a copy of her great memorial. Libeskind is an architect of undeniable quality and uncommon promise, but many of his designs betray the hyperactive virtuosity that the former musical wunderkind has never really outgrown. The star system in his chosen profession can be just as destructive to the naturally talented as the star system in the profession that he left behind. One hopes that this intriguingly gifted artist will channel his prodigious energies into work that is as solidly grounded as his Jewish Museum in Berlin, a work that will explain to future generations what cannot be said in words about the twentieth century's darkest deed.